Multiple uses in plumbing & heating, particularly useful on plastic waste fittings. Jaw capacity 68mm, jaw depth 55mm. 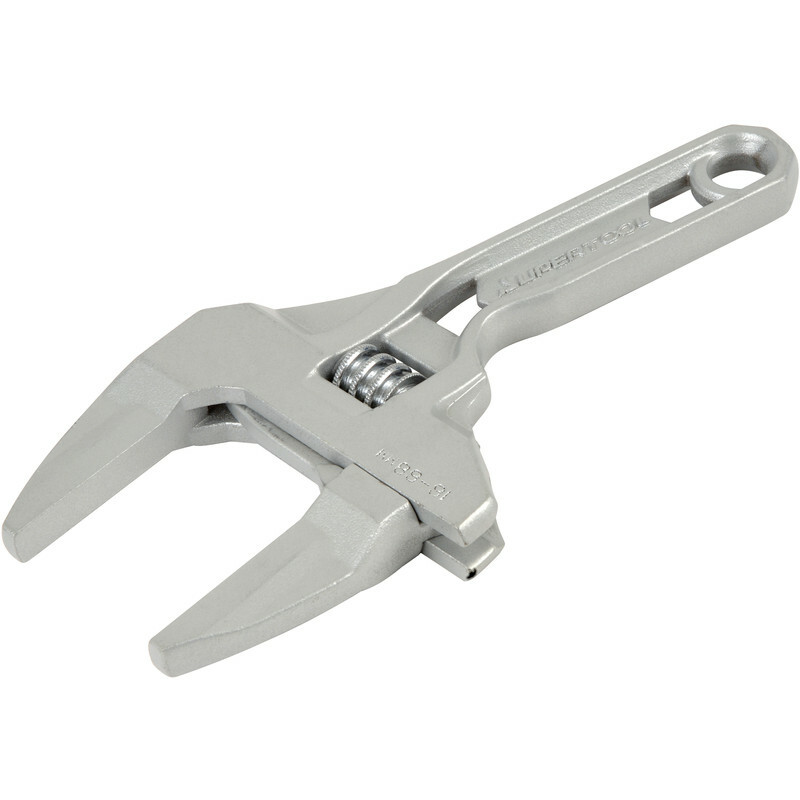 Superwide Jaws Adjustable Wrench 8" (200mm) is rated 3.0 out of 5 by 11. Rated 5 out of 5 by Anonymous from Great bit of kit! Brilliant tool, lightweight and fits every size gland on the railway equipment I install. Would definitely recommend, even my work colleagues are purchasing it. Rated 1 out of 5 by Noj1 from Soft Metal The Wrench is made in an alloy which is softer than metal objects to be tightened, and the jaws deform and bruise. Rated 2 out of 5 by DIYChristoph from Fine for occasional use Needed to remove and refit a plastic basin waste in a confined space and it was easy with this wrench. But later trying to loosen an old brass waste from a butler sink the lack of leverage from the short handle and soft metal of the jaws really showed - after only a couple of attempts and the wrench slipping the jaws have deep gouge marks, and that was only on brass not a hard stainless steel. If you've got one job to do and need to tighten a large nut it'll do, but I can't imagine would last long for everyday use. Rated 3 out of 5 by Anonymous from OK for tightening plastic waste fittings This wrench is OK for tightening plastic waste fittings, but it cannot untighten an already overtightened plastic fitting, because the jaws do not grip firmly enough. The jaws on the one I bought can be adjusted up to 65 mm wide. Rated 4 out of 5 by GuyC from Not bad This is aluminium, lightweight and easy to use but not as stiff or strong as steel. Rated 4 out of 5 by Belgrave from Good but one issue. Great design, jaw opens wide and with the short handle its great. The only downer is the strength of the metal used. On plastic nuts (basin waste) etc its fine, on metal nuts only use to hand tight because the metal of the jaws is just too soft and get chewed away. Would be a great allrounder if the metal was harder. Well worth having in the tool box despite its problems. Rated 3 out of 5 by Ridge back from Good tool Bought this a while back a lot of money for what it is. But then its jaw opening of 68mm is what sells it. Plus small handle for getting in those tight spaces. Reason for giving it three stars is the ally is too soft For steel fittings. Made from same steel as a standard adjustable. Be perfect. A handy tool but won't last too long.